Designed to house electrical and electronic controls, instruments, and components. The SCE-ELJ provides protection from dust, dirt, oil and water. These consolets can be used indoors or outdoors and can be mounted on either of two sides to give a control surface inclined 30° or 60°. They can also be mounted on desks, machines, or pedestals. Finished in ANSI-61 gray powder coating inside and out, optional sub-panels are powder coated white. 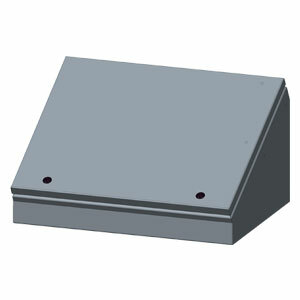 Sub-panel for SCE-8C8ELJ, 6 x 6.75"
Sub-panel for SCE-8C12ELJ, 6 x 10.75"
Sub-panel for SCE-8C16ELJ, 6 x 14.75"
Sub-panel for SCE-8C20ELJ, 6 x 18.75"
Sub-panel for SCE-12C12ELJ, 9.5 x 10.75"
Sub-panel for SCE-12C16ELJ, 9.5 x 14.75"
Sub-panel for SCE-12C20ELJ, 9.5 x 18.75"
Sub-panel for SCE-12C24ELJ, 9.5 x 22.75"
Sub-panel for SCE-16C16ELJ, 14.75 x 12.88"
Sub-panel for SCE-16C20ELJ, 12.88 x 18.75"
Sub-panel for SCE-16C24ELJ, 12.88 x 22.75"
Sub-panel for SCE-20C20ELJ, 16.38 x 18.75"
Sub-panel for SCE-20C24ELJ, 16.38 x 22.75"
Noter: * Sub-panel sold separately.